The Caribbean Sea Jazz Festival just provided Sirk TV with this exclusive promo highlighting their performers this year including Chaka Khan and Oscar D’Leon. Stayed tuned for upcoming broadcast interviews with some of the headliners. Only on Sirk TV! Paramount just provided IR with this new image of Russell Crowe as the title character in director Darren Aronofsky’s “Noah”, which hits theaters in May 2014. 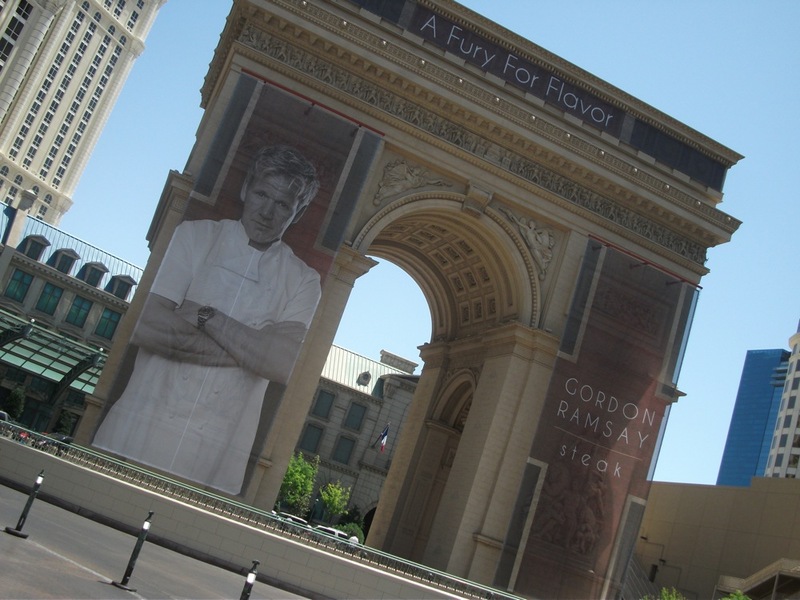 Opening a restaurant in the fray of Vegas Uncork’d sometimes is not advisable but Gordon Ramsay never does much by the book but his insistent perfection interrelates in the texture of his first Vegas eatery: GR Steak. Buoyed by trying to find a balance between good food and not an overlay of fine dining finds a good partner in this new venue inside the Paris Las Vegas. Using the idea of a “The Chunnel” perception between London and Paris, the space located just off the casino floor not far from the Eiffel gutted an aspect of floors to create a winding open staircase that creates a room both breathable and intimate. 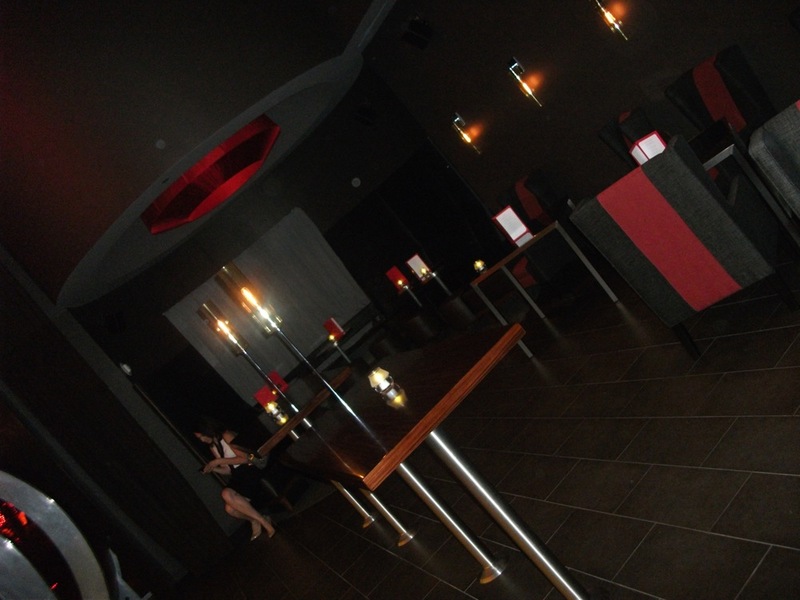 The open kitchen structure plays to this in various ways while the specifically designed uniforms for the wait staff, bartenders and hostesses create an interesting and sultry throwback to 40s underground dinner clubs with a sense of cool and class. 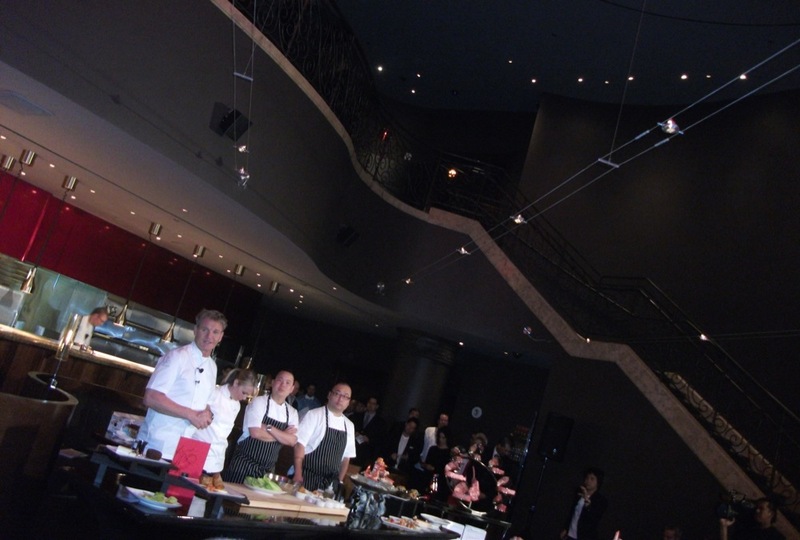 Ramsay, newly arrived from Europe, for the launch took questions and demoed two dishes: his signature Caesar and his Beef Wellington showing his pertinence for both flavor but not an over-saturation of ingredients. 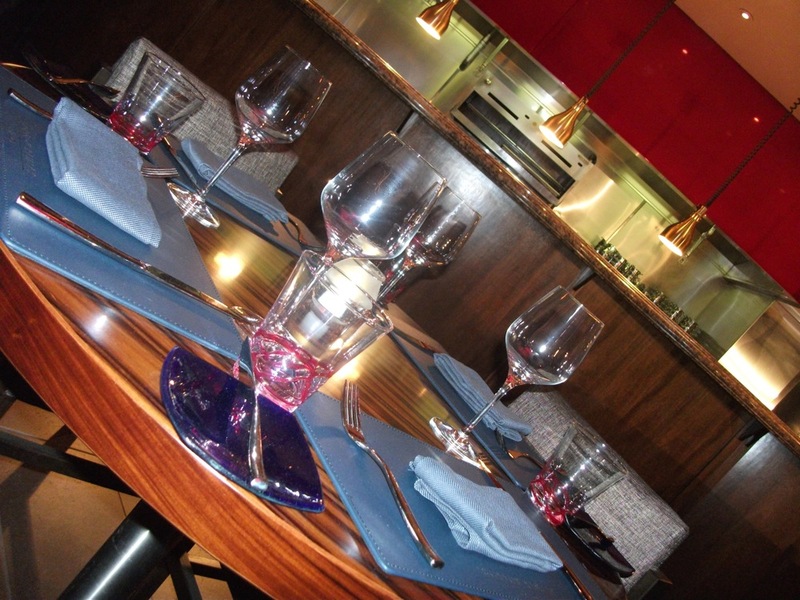 However cocktails and craft beers, along with the stalwart wine, do play an important part in his evolving approach to food. He specifically related in a question from Sirk TV that pairing dictates the modern dining experience and, in many ways, intersperses this in his new restaurant with several signature cocktails as well as the inclusion of one of his favorite craft brews: Innis & Gunn (better known as “Innocent Gun”). 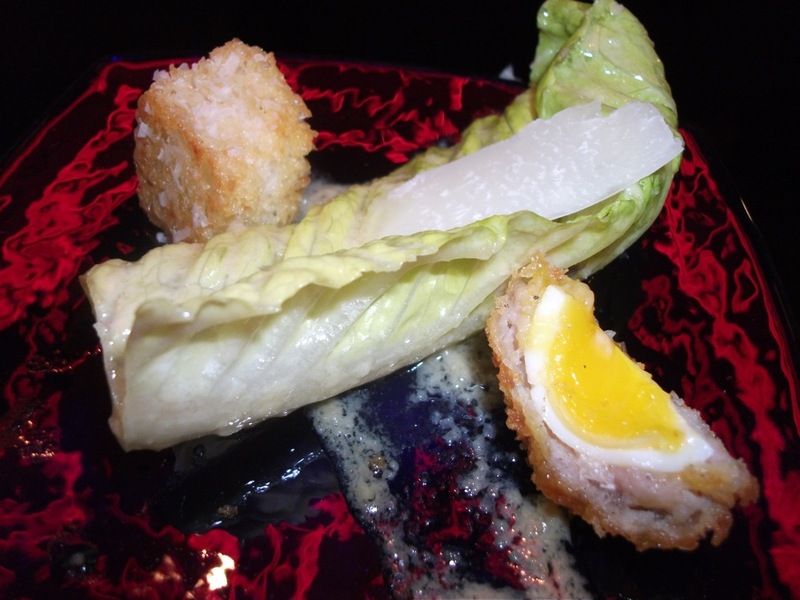 The Caesar Salad using Romaine stalks with just a touch of dressing waxed favorite with anchovies minced but hardly even noticeable though it was the inclusion of quail’s eggs gave it that extra special hit. 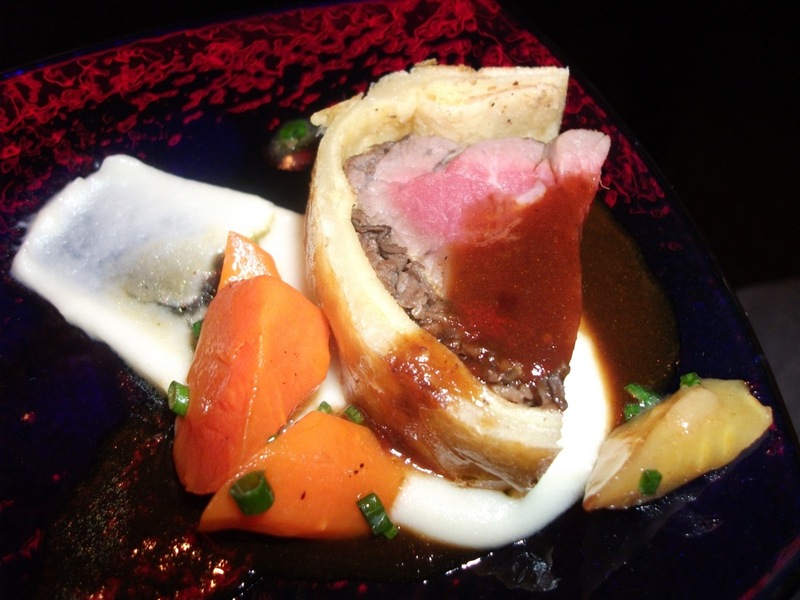 The Beef Wellington sang with a tang of perfection with a standard not overdone with a small wisp of puree potatoes and carrots that accented without overwhelming the progression. 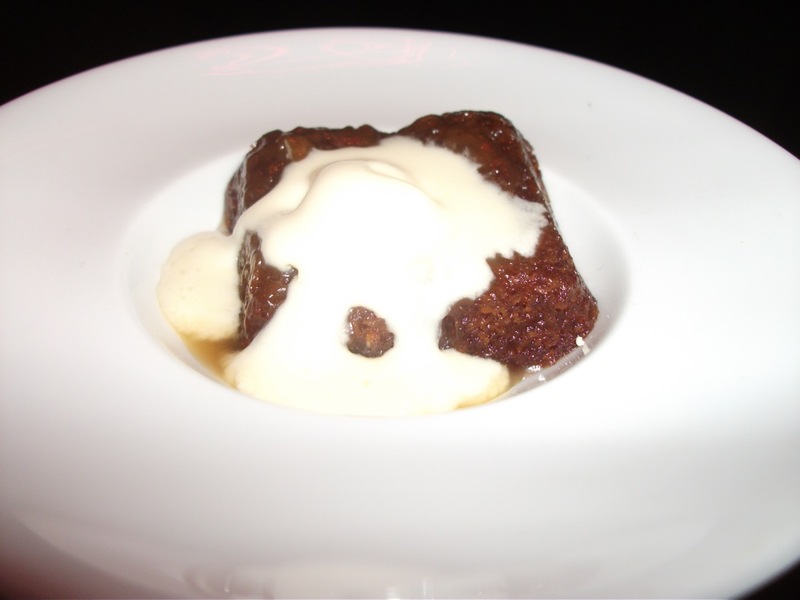 The closer, which Gordon specifically labeled “unique”, was a kind of toffee pudding cake that related “lava” in many ways but melted in the mouth nonetheless. With the breathe of chefs making their way across the Strip, competition is intense but Ramsay approaches it as anything else he does: with a sense of style like a bat out of hell.